Firstly, congratulations on choosing Japan as your next holiday destination – you won’t regret it. From the moment you land you will be swept up in a world of cultural extremes. There’s the more traditional Japan filled with temples, sumo and geisha and a new age of the latest gizmos and gadgets, anime and the craziest fashion you’re ever likely to see. My girlfriend and I travelled to Japan in October 2013, for a total of 16 days. Neither of us spoke a word of Japanese and we had never been to the country before. Below is an overview of everything we learnt from our experience, to give you a better idea of what to expect and how to prepare. The Japan Rail (JR) system is really easy to use and perfect for anyone who wants to see more than just Tokyo. 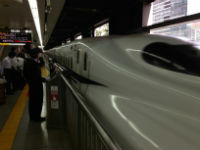 It gives you unlimited access to all JR lines, which includes most of the bullet trains. Keep in mind that the passes are quite expensive (we purchased a 14-day pass for $500 each) so it’s only worth getting if you’re covering large distances. The JR Pass is only available for foreign passport holders, and has to be purchased prior to arriving in Japan. You can only order these passes online (http://www.jrpass.com/) and an exchange order will arrive via post within a week. Don’t lose the exchange order as you need it to get the pass once you’re in Japan. Swap the exchange pass at any JR ticket office (usually located within the train stations) for your pass, and you’re ready to go. Japan isn’t one of those places where you can just arrive and sort out accommodation on the day – especially not in Tokyo. Because of the massive influx of people to the city, especially on weekends, accommodation goes quickly. I’d suggest booking at least two months in advance to get a good location. The last few remaining options are either really far away from the action or really expensive. This is the same for all major cities, including Kyoto and Osaka. The smaller towns are easier to find accommodation closer to your arrival. I always get travel insurance when heading overseas, even if it’s for a couple of weeks. You just never know what’s around the corner and insurance makes things a lot easier to deal with, especially in a foreign language country. For the best value for money, I’d recommend Southern Cross Travel Insurance. We also purchased a Travel Money card from Commonwealth Bank, which was great value. Neither of us had an account with the bank and it only cost $15 to set up. It meant no transaction or exchange fees on any card purchase – saving us hundreds. There are many travel card options available through the major banks, but I found this comparison article really helpful. The official Japanese currency is yen. When we left, one Australian Dollar was equal to 90 Japanese Yen. We used the conversion rate of 100JPY = 1AUD and it made things pretty easy to work out. Depending on where you are coming from, try and simplify the exchange rate to multiples of two, five or ten, as it’s easier to convert in your head when shopping. I won’t lie, Japan is not a cheap country to visit on holiday. In fact, everything is about the same price as Australia for food, drinks, coffee, accommodation and even tacky souvenirs. If you look around, you can find fairly cheap food and drinks but try and budget for about $50 a day per person and you can manage, not including accommodation or transport. One of the first things we noticed was how friendly the people were. It’s really refreshing. No matter where we were in the country, random locals were always coming up and helping with directions, taking photos for us and translating Japanese menus. The people are all about respect and honour, so just remember to be polite, speak in few words, always bow and you will be fine. The communication barrier is hard in some areas, especially in more remote parts, but there is usually an English translation available at most places. If you are eating out, choose restaurants that advertise an English menu or have picture displays out the front, then you can just point to what you want. The standard of accommodation and location will vary depending on your budget. Hotels are great if you have the money, but rooms are much smaller than you’d expect. I’m roughly 6-foot and hit my head on so many door frames that I lost count (perhaps from minor brain injury). Backpacker hostels are great value for money, but you will struggle to find a place with a private bathroom. Ryokans are traditional Japanese rooms with mattresses on straw flooring, and I definitely recommend staying in at least one ryokan during your trip. There are some good ones in Kyoto. We booked most of our accommodation through Booking.com and had no issues. Just make sure you check where they are located on a map, and read the user reviews. 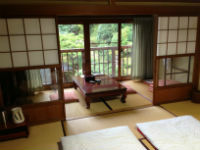 We were also staying in some places during the autumn festivals and accommodation was completely booked. Luckily, I just emailed each of the places individually and we eventually landed somewhere after a cancellation. If you are going in peak season I’d recommend doing the same. No matter where you go in Japan, you will notice the streets are ridiculously clean. There are always people walking around picking up rubbish and I’m still not sure whether they’re even paid to do it. This is also really surprising considering there are absolutely NO rubbish bins. If you need a bin, try looking near vending machines or 7-11 stores. The food is one of the best things about going to Japan. You can literally eat your way around the country. 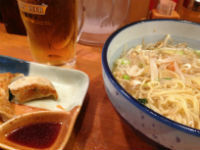 The best thing is that every region specialises in their own dishes (such as ramen in Kyoto). The best places are usually the hardest to find, and come in the form of street vendors or holes in the wall. You can get all sorts of weird and wonderful things, including sweet beans, fried rice balls, marinated tofu, seaweed wraps and plenty of delicious kebabs. We even found one guy in Koyasan who made Japanese-inspired hot dogs, and they were incredible. It’s surprising how heavily influenced they are by both Italian and French cuisine. You’ll find a lot of pizza and pasta restaurants, and boutique French patisserie with the freshest breads and desserts. Mmmm. While it’s not generally known, the Japanese are also great at making traditional Western food. I had some of the best burgers I have ever eaten in my life, including the $50 cheese burger at Tokyo’s Park Hyatt Hotel – definitely worth trying if you can justify the spend. There is never a short supply of places to get a drink in Japan, and if you can’t find a bar then you can always grab a cheeky beer from your nearest street vending machine. In the big cities you can always find a bar doing Happy Hour prices each afternoon, so drinking on the cheap is easy. Kirin is my pick of the local ales and I recommend trying at least one type of sake, from a local brewery if you get the chance. Suntory Yamazaki whisky is also recommended for those who enjoy something stronger. For travellers chasing a non-alcoholic drug like coffee, look out for cafés that advertise “real coffee” and you should be right. A lot of the smaller cafés only have the drip coffee you associate with North American diners, which is pretty disgusting. If you want to play it safe, there’s usually a Starbucks located in every town and on nearly every block in Tokyo, so head there for a reliable latte when in need. WiFi is not as easy to access as you’d expect for such a technologically-advanced country. There are lots of free WiFi spots available, but you can only access them if you have a Japanese SIM card in your device – including in places like Starbucks and McDonald’s. You can either purchase a SIM card in Japan, which is also great for calling hotel shuttle services, or you can try your luck. I’d suggest looking for accommodation with free WiFi services, as it makes life a lot easier. The Japanese public transport systems is one of the most efficient and reliable in the world. In Tokyo and Kyoto, you will have no trouble getting to where you want to go by either train or bus. The train network in Japan is so easy to navigate, especially with a JR Pass. You can get anywhere within minutes. With a JR Pass, you can also reserve seating at no extra cost, which is great for the long rides. There’s nothing worse than nursing a heavy backpack on a crowded train for three or four hours. The reserved-seat carriages are very roomy and have plugs for charging phones, tables and food carts. Luxury! Like New York and London, Tokyo is one of the greatest and most interesting cities in the world. It should be on everyone’s travel bucket list. The worst part about our trip was that we only had three nights to explore Tokyo, when we really needed more. You could easily stay for two weeks and never get bored as there’s so much to do. 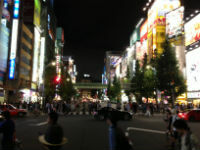 Shibuya and Shinjuku are the two areas I would recommend staying, as they’re very central and offer the best culture, food, drinking spots and shopping. Harajuku is situated right between the two, so make sure you take a day to visit the area – it’s where you’ll find all the latest fashion and shopping, and right next-door is Yoyogi Park, where you’ll find all kinds of buskers and performers. It’s a great spot to sit and people-watch on a Sunday. If you have a few days, the attractions I recommend seeing are the Tsukiji Fish Markets, south of the main CBD, Roppingi Hills for the view from the Midtown Tower and the museum in the same building, and Akihabara if you’re into gizmos and gadgets. Ebisu is the upmarket end of town and has some great boutique shops and small cafés. 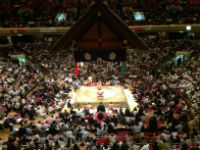 The sumo season on runs every second month, but if you are in Tokyo at the right time then definitely make it a priority. You can check the season schedule and buy tickets here and the main stadium is located in Ryōgoku. Kyoto is much smaller than Tokyo, but there’s still lots to do. The city is described as a flat tray with raised edges and from the view of the food court (11th floor) at the train station, it’s easy to see why. The entire city is flat and surrounded by mountains on every side. The mountains are where most of the main temples and shrines are located, which is why most of the buses run around the outskirts. 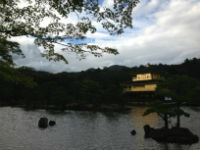 The two main temples, The Golden Pavillion (Kinkau-Ji) and Silver Pavillion (Ginkakuji) are impressive sights. But our favourite day was exploring the Arashiyama region, where you can explore Bamboo Grove and Jojakkoji Temple, which is a bit out off the main track but was easily our favourite temple. If you’ve got a few days to spare, Kyoto is also renowned for their onsens, which are natural hot springs. Some pools are indoor and others outdoor, so where you go will probably depend on weather. After a relaxing day you should also head to Kyoto’s Down Town for the night. If you’re lucky you can see some geisha. A good spot is Hanami-koji Street in the Gion area, between 8pm and 9pm. To be honest, I really wasn’t looking forward to visiting the Peace Memorial Museum because I thought it would be a lot like the Vietnam War Museum, where they used a lot of disturbing images to illustrate the violence and horrific nature of war. The Hiroshima Museum takes a much more objective approach, giving you all the facts and background. That being said, the museum is separated into two parts and the second room showcases the aftermath with photos and remains – which is really hard to digest. Unfortunately, the Mount Fuji climbing season only lasts for two months of the year – July and August. If you aren’t going at these times, the next best thing to do is visit the “Fuji Five Lakes Region” in the Yamanashi Prefecture, as they offer the best view. However, there’s still no guarantee that skies will be clear enough to get a good view – it’s completely up to nature. You can travel Japan quite comfortably in two weeks without being too rushed, due to the fact the train system is so reliable. That being said, there is so much to do and see that you could easily spend a week in Tokyo alone. Also, if you are planning on a snow season or visiting during one of the major festivals, then you will probably need longer. Between two and three weeks is perfect.